Review Summary: The mantra is to entertain and the target audience is any moviegoer who is ready to forget logic sense and judgment for the next two hours. Besides David Dhawan and Priyadarshan, one maker who has an impressive track record as far as comedies go is Indra Kumar. The mantra is to entertain and the target audience is any moviegoer who is ready to forget logic sense and judgment for the next two hours. Remember how, as children, we would stage a school play? The sets were shoddy. 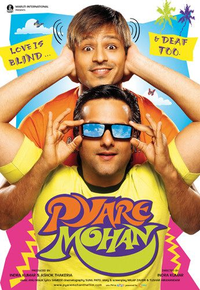 Director Indra Kumar's caper about a deafblind duo is further affirmation of the fact that this summer vacation is comedy time in Bollywood.